The current owners of 36 Albany Road in Ranelagh bought their home in 1980, and undertook a major renovation prior to their wedding the following year. But they had barely moved in and had a chance to enjoy their new home before work took them abroad. Initially they intended to be away for between three and five years, and to make 36 Albany Road their family home when they returned to live in Ireland. But, as can happen, that sojourn was extended over and over again and ended up continuing for decades. Now the couple have decided to retire to the US. In the intervening years, 36 Albany Road has been rented out, but - although the house is in need of some modernisation and upgrading - it has the feel of a family home that has been well looked after. New double-glazed windows were installed in 1999 (these appear to be in excellent condition and do not look 20 years old) and the house was re-wired and re-plumbed in 2008. To the front of No 36 is a neat railed garden with off-street parking, and the double front door retains what appears to be its original stained glass panels. Once inside, it's obvious that, compared to more-recently built properties, the proportions are generous. The entrance hall is nicely bright, and to the right are two good inter-connecting reception rooms - there are sliding doors between the two - each with a charming original fireplace fitted with an attractive copper hood. There are doors out from the dining room to the back garden. The kitchen lies to the back of the house and is compact and dated. New owners will want to upgrade and enlarge this, but they will be not short of options as to how best this can be achieved. They might consider knocking through to the dining room, or extending out to the back and side, where there is currently a garage, utility room, loo and storage room, subject to planning permission. A quick look at what other houses along Albany Road and other similar streets in the immediate vicinity have done indicates that there is precedent for a substantial two-storey extension here, which would increase both living and bedroom space. Upstairs, there are three bedrooms, all doubles, and a shower-room. The garden, which faces north-west and extends to 21 metres, is much larger than one expects to find in Ranelagh. 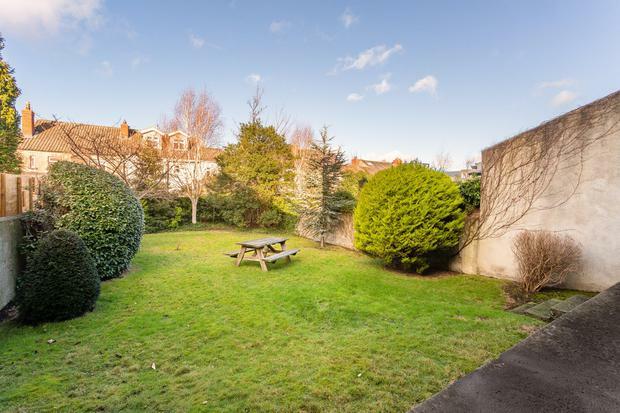 New owners will probably want to get the landscapers in, but there is plenty of space for play equipment, dogs, vegetable patches and greenhouses. Ranelagh is consistently one of the most desirable villages in Dublin, thanks to its proximity to the city centre and the Luas. For families, there is a fine choice of schools, including Scoil Bhride, Kildare Place, Gonzaga, Sandford and Alexandra College. Ranelagh is also known for its excellent shops, pubs and restaurants. The Village Butcher keeps locals supplied with great meat and an ever-expanding range of artisan food products, while the Company of Books is the independent bookstore that every village wishes it had. Ranelagh also has branches of SuperValu and Lidl, with the Swan Centre in Rathmines, home to Dunnes, The Hopsack and Fallon & Byrne, a short drive away, and Morton's close by on Dunville Avenue. You will never go hungry in Ranelagh. Nightmarket serves what many regard to be the best Thai food in the capital, while The Butcher Grill is the place for steaks and Dillingers the go-to spot for brunch. If you want to eat small plates at Host you'll have to book well in advance; there are good reports of new arrival, Gigi's, too.